Hi, I am interested in your 1940 Ford Deluxe (stock #1292-NSH) listed on Autotrader for $68,995. I'd like to get more information about this vehicle and confirm its availability. A rare treat. This 40 Ford has the gorgeous curves and that beautiful grill leading the way that makes these cars so popular on the street rod scene. But it is also a drop top cruiser. One that you dont see too often, making it a unique and special ride. Check it out. If you are into open air cruising but prefer to drive a car that is like nothing else on the road, then this may be your ride. Its hard to beat the lines of a 40 coupe, but if you remove that roof and replace it with nothing but open air, well, you may have just done it. You will attract plenty of admirers as you roll down the boulevard in this Red convertible, and they will have a clear view of who is driving. So, when you do, get ready to smile and wave a lot. Leading the way is that vertical chrome grill spreading out from the center underlined by a simple chrome bumper. A tall flat hood tapers back and outward from the nose with headlights perched way out on the fenders. Those separate fenders are hunkered down over beautiful chrome wheels and a chrome highlight starts at the front running along the top of the doors turning down to follow the trunk line at the rear. Open the door and you will find an interior trimmed in Black with all the comforts and conveniences of a modern car. The door panel itself is vertically pleated with a smooth top. Power window switches are at your fingertips and a speaker is mounted in the lower corner. A comfortable split bench seat gets the same pleated treatment with smooth leading and top edges. A leather wrapped steering wheel has a 3-spoke wire hub and is mounted on a tilt column along with a mini tach and a shifter for the automatic transmission. Behind it is a Red dash with a chrome insert containing VDO gauges with the Speedometer in the center flanked by engine gauges on each side. A Pioneer head unit is mounted in the center with a Kenwood XM radio below the glove box for your listening pleasure and there is air conditioning to keep you cool when the sun gets too hot and the top goes up. Open the hood and you are in for a pleasant surprise. There you will find a very chromed out, and very stroked out, 383 cubic inch LT1 motor nestled down in a very polished up and detailed out engine bay. Virtually everything is chrome in here, so put your sunglasses on before you raise the hood when the sun is out. There is a free flow air filter feeding the engine and shorty headers getting the spent gasses out and back to dual mufflers. Power flows back through a 4-speed automatic transmission to a Ford 9 rear end with 3.00 gears located by trailing arms with adjustable coil over shocks. Tubular control arms and coil springs keep the front end under control with the help of a sway bar to keep it cornering flat. Power 4-wheel disc brakes can haul this car back down from speed in a hurry and the rubber meets the road through 235/60/R16s in the back and 205/65/R15s in the front mounted on those chrome Scripts rims. 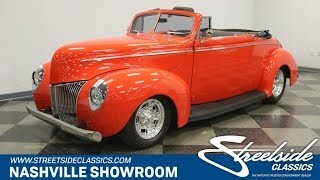 Beautiful 40 Ford styling, drop top fun in the sun, and a very tricked out LT1 under the hood. It doesnt get much better than this. Unless maybe it was sitting in your driveway. Come on down and check it out. You might just decide to take it home with you.